An easy and healthy recipe when you’re craving something sweet? Sign me up. I made this yesterday, and probably will be my go to snack until I can’t eat it any more! What you need… an apple and cinnamon sugar. Yup that’s all! I’m not a germaphobe by any means but I can’t eat fruit if it hasn’t been washed. I got this Fruit and Veggie spray from The Honest Company. It wipes away pesticides, pathogens, wax, dirt, germs, & more with their 100% natural, non-toxic formula that leaves fruits & vegetables truly clean. Just spray on the fruit let sit for a minute or two and wash with water! Then bake those apple slices after you mix them with the cinnamon sugar at 400 degrees for 15-20 minutes. 2 tbsp Cinnamon Sugar ; You can mix regular sugar and cinnamon powder if you don’t have it pre mixed! This post is being written because today is my parents 32nd wedding anniversary! Two years ago we threw them a combined birthday and anniversary party where I was in charge of getting pictures from over the years. I had so many but at the time I didn’t have these frames. So for some months after the photos stayed just on poster board. I decided last year that for Christmas I was going to redo our hallways photo collage as part of my Mom’s Christmas present. I really wish I had a before pictures of the frames that were up from the late 80s/early 90s. I wish I had better photos than these iphone pictures but you’ll get the idea! 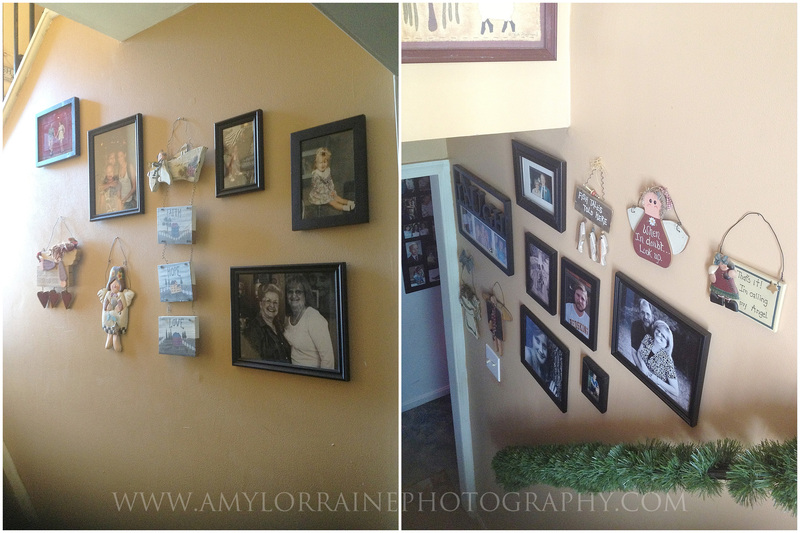 I got these collage frames and some more set of frames to hang and my sister and I gave the hallway a fresh coat of paint! The three center frames read “We may not have it all together, but together we have it all”, “In time of test, family is best” and the center frame holds my parents birthday, their anniversary in red, and then their children’s birthdays. I had more frames left over so I started another collage grouping going up the wall, that hopefully over the years will be added too. I wanted to try the super simple recipe I saw on Pintrest. How fun will these be on Easter Morning? The rolls came in a pack of 8 so you get 4 bunnies. Take four rolls and leave them in the spiral. Unroll the other four and fold them in half twice to make the ears. Squish together and bake! Drizzle with icing and enjoy! Last week I helped my mom put together this beer cake for a friend’s surprise birthday so I thought it would be great to put together for my brother’s birthday with Half & Half Arnold Palmers! Put the first circle cardboard cut out down wherever you want the cake to be displayed. Not intended to travel. Then add the bottom layer of cans. Ours both had 14 on the bottom. Then place next smallest cardboard on top and add middle later of cans. Repeat with the top layer of cardboard and cans. Finish with ribbon around each layer to secure and curling ribbon throughout for decorations. Decorate the rest until you’re complete! I have all these plastic hangers and off the shoulder shirts do NOT mix. Since I hang up all my shirts I needed a solution to the everlasting problem of the shirts falling off the hangers. Take your regular hanger and your hot glue gun. Run a zig zap pattern on the top of each side. Once dry hang up shirt.